People tell me I’ll regret it if I don’t plan something big for my 50th birthday. I’m about to turn 50. Like my 12-year-old son, I’m experiencing changes in my body that are, at best, confusing, making me feel like an amateur at things like hair removal and feminine hygiene. My girly hormones are in retreat and I can’t remember where I put my keys, ever. Or anything, ever. I have a mustache and orthotics in my Clark’s shoes. Midlife is a game changer, but like the old cliche says, “it beats the alternative” and, although it has its pitfalls where the ego is concerned, I’m not bummed about turning 50, not by a long shot. Turning 50 is exciting, a milestone and I’m lucky to have made it here. Not since I packed my car full of record albums and candles, heading off on my own for the first time have I felt such curiosity about what the future holds. Of course, this time I have a husband beside me and two kids in the back seat, but the feeling is similar. People expect you to do something BIG on your 50th. It’s a thing. So important is this rite of passage that some people plan their 50th celebration for years. They take safaris and things like that. The conversation plays out over and over, in much the same way. “Do you know what you’re doing for your 50th?” asks another friend. This last comment is sort of the friendship equivalent of your mother saying “Put a sweater on, I’m freezing.” Some friends have major regrets over not planning a big 50th thing, others are working through anxiety about what to do for their own, looming on the horizon. It’s not like I haven’t thought about it. Originally, I figured the best plan would be to get started on something early so that, when my birthday arrived, I would ring in my second half century feeling great. This is why, a few months back, I decided that I would lose weight. I have put on almost 20 pounds in the same number of years and decided 15 of them had to go. I resolved to go to the gym and got that little point counter thingie on my iPhone just for, you know “fun.” A newly trim body would be my birthday gift to me! Then I decided I would start meditating again and take this herbal supplement that a very smart and healthy friend of mine told me about. During the last year I’d noticed an increase in anxiety of the snapping, steering-wheel-gripping kind, and I was looking for relief. Twenty minutes of mindfulness meditation, a pill, and within a month or two I would hit 50 feeling full of energy, in a good mood, and my elbows wouldn’t hurt. I shelled out the bucks and bought a few bottles. Let’s just say the jury’s still out, but yesterday I cried on the phone with Time Warner, so draw your own conclusions. Like many of us, since having kids, my personal productivity has gone down the drain. I do all kinds of things for my sons and husband, but I’ve left my own creative aspirations dying on the vine. 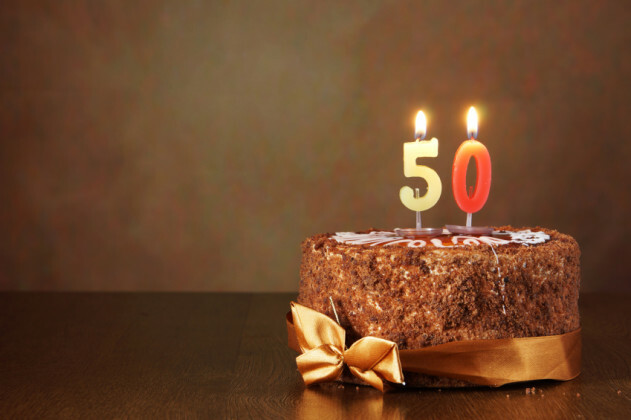 To me, turning 50 means reclaiming what I’ve let fall away. I decided that I would challenge myself to 50 days of writing a thousand words a day, but on the day I needed to start, I think I was busy swallowing herbs and calculating the calories in half a Pop Tart with the frosting scraped off, so I missed that window. This whole thing has been a little stressful. My friends can see it. In the past month alone, people have suggested I try yoga, take a vacation, get regular massage, hypnosis, one texted me the name of a doctor who can check my hormone levels and “work wonders,” and I’ve received a pile of Xanax and a baggie of Valium, separately, as gifts. People know I’m in the weeds. That reminder, gentle and perfectly crafted, unscrambled my weary mind. Like so many of my women friends, I have been walking on my knees and repenting for most of my life. The career flubs, family issues, weight gain, lack of education, lack of accomplishment, lack of patience or talent or goodness—correcting or covering all of these imagined shortcomings is the equivalent of walking a hundred miles through the desert, and the last thing I want to do is meet the end of my 50th year like that. What if I celebrate this birthday by forgetting, for once, the tweaking and improving, the five-year plan and the 30-day challenge, and simply let my body “love what it loves?” Right now I love the quiet hours I devote to writing in the early morning. I love drinking a glass of wine with friends. I love walking. I love the family that has grown up around me, like a miracle, and I love the frosting on my half a PopTart. Maggie MacMillan is a wife, mother, writer, homeschooler, retired manicurist and recovering actress, living Botox-free in Los Angeles.